Congratulations to Iamuniquelyimperfect who said: What a gorgeous creation! Your coloring is amazing and I love your layout. You're name will be in the $20.00 Gift Card Drawing on October 6th!! For my project today I decided to do my first... I guess you would call it an art journal page. It is not in a book yet, and I didn't use any fancy mixed media stuff...just my favorite stuff that I like. 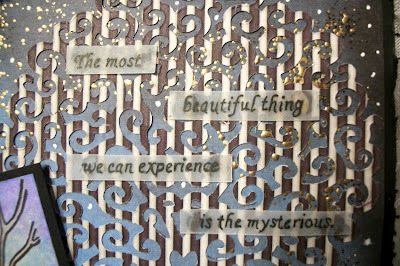 But I guess there is no right or wrong way to art journal...so that is what I am calling it - LOL! I used one of my favorite Ching-Chou Kuik images called Dark Sirene and colored her with copics. My page is 6 1/4" x 6 1/4". The Designer paper I chose is from the Gorgeous Girls line...totally my favorite paper ever and I will be getting it listed in the store, hopefully by early Monday morning :) I frantaged the edges, again this will be in the store soon too! The flowers are some of my favorite colors and they are from prima...will be in the store soon too - LOL! The die cut tree is the La La Land Heart Tree Die and I used the Martha Stewart Branch Punch to punch some branches for under my flowers. This is part of the sentiment that comes with the Ching-Chou Kuik The Seahorse set. I completed my page with one of my favorite butterfly embellishments that I bought of Etsy. I did the background around her with copics by dotting different colors and then blending them with the lightest yellow and teal I had. Then I sponged the edges with Tim Holtz Distress ink in Shaded Lilac. Be sure to check out what the other Designers have for you today!! Don't forget to leave comments on all the blogs for the most chances to win to be in our drawing on October 6th!! Enjoy your Sunday and thanks for stopping by! As You Like It Challenge - Favorite Flowers or Favorite Trees - These Prima Flowers are my Favorite because, I love the colors they come in as they are pretty neutral and I love that they have a gold type embossing on the petals already. Wow, that is stunningly, glittery gorgeous! Wow, this is fabulous! Love the colors and the great design with your image. Amazing. How beautiful Laura! I love all the detail you have added. It will be awesome in your journal! Have a great week! 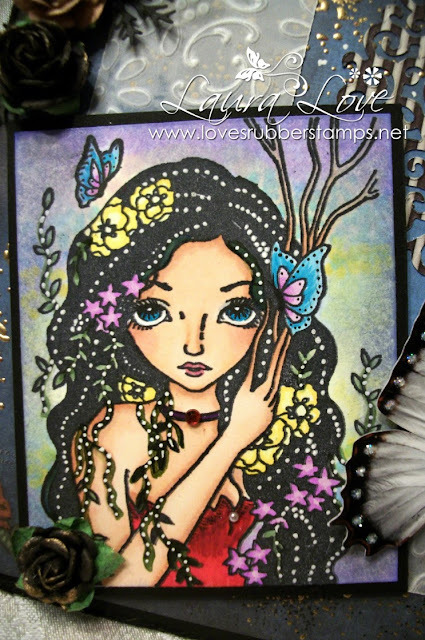 This is gorgeous & I soooooooo love the image, I have this stamp also. Beautiful card Laura - love it! Thanks for joining us at Creative Fingers. A gorgeous image Laura and great colour choice. Absolutely gorgeous! Your coloring is amazing. Thank you for joining us this week at 613 Avenue Create! Fabulous card LOVE those prima flowers too! so pretty! Thanks for adding the info next to the link up! Love your page... It defiantly should go in an art journal or something. Well done. Stunning. Beautiful colouring and the butterfly is gorgeous. Very beautiful card. Your coloring is amazing. Thank You for sharing over at the Robyn's Fetish Challenge Blog. Fabulous! The dp used for the tree is great. Love the effect it gave. What a gorgeous card thankyou for joining us at challenges 4 everybody and good luck. Fiona DT. This is lovely. Thank you for joining the challenge at Sweet Pea Stampers. Hope to see you next time. Such a pretty image and a beautiful card. Love it. Thank you for sharing with us at C2CU Challenges. Stunning card. Thanks for joining along with southerngirlschallenge . Thanks for sharing with us at Sweet Stampin' this week. Laura, this is quite imaginative and so very well done! I love your awesome attention to detail in your designs! Great job! Thanks for slipping this under our door here at 613 Avenue Create! 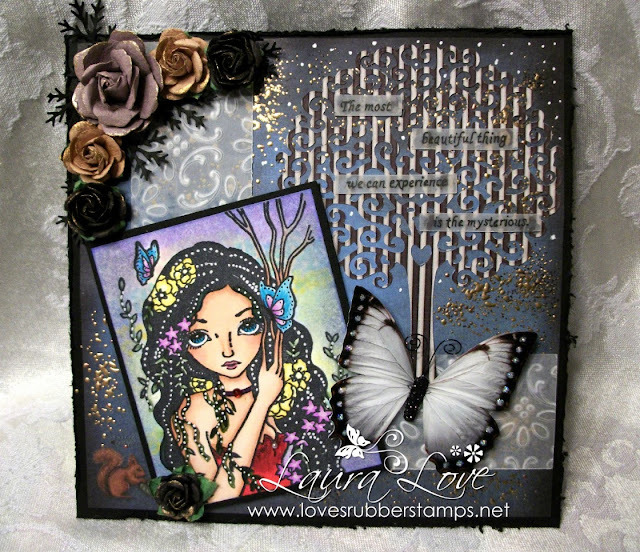 Thanks so much for playing along with us this week for the Catch The Bug "Anything Goes Challenge” with Bugaboo Stamps! Just loved your card, and hope to see more of your work in future challenges! Be sure to check out The Bug Blog for our newest Indian Summer challenge beginning today! We hope you’ll play along! Your card is GORGEOUS! LOVE your pretty colors. TFS. Wow, fab image. I love all those gorgeous colours in her hair. Thank you so much for joining in with our ‘Favourite Trees or Flowers’ challenge at the As You Like It Challenge. Fabulous textures and all those wonderful colours. 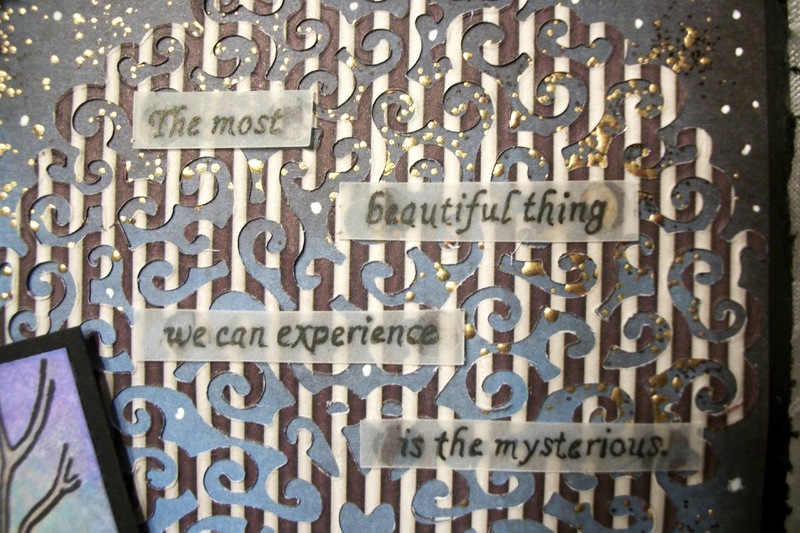 Thanks for sharing your wonderful journal page with us at C2CU this month.